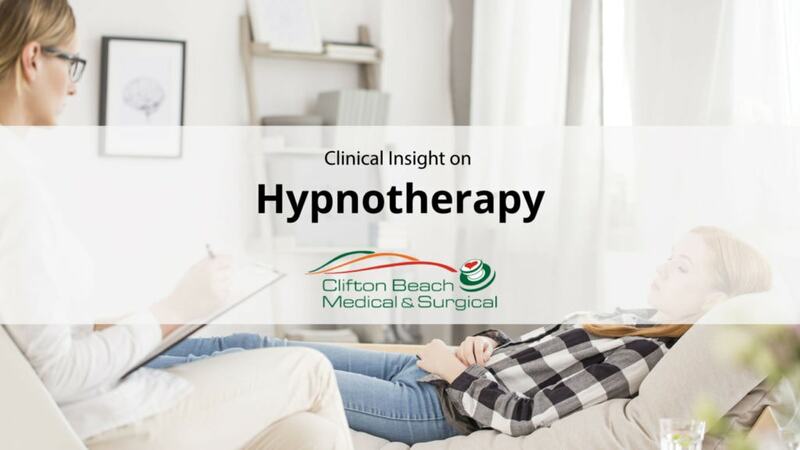 Dr Lindsay Martin from Clifton Beach Medical and Surgical discusses the ins and outs of hypnosis & hypnotherapy. Hello. Today we’re going to be talking about hypnosis, otherwise called hypnotherapy. Hypnosis has been used for centuries. Today it is recognised by the scientific community as an effective healing tool in order to treat a range of medical disorders that have primarily a psychological or emotional origin. We can use hypnosis to change unhelpful, unwanted attitudes, perceptions, sensations and behaviours. But, what is hypnosis? Hypnosis is essentially the method of inducing a trance, a dreamlike state of deep relaxation and with this comes a focused awareness of your internal world. Essentially, our brain has many different levels of consciousness or awareness. Ranging from being fully alert, to drowsy, to fully asleep and with this all number of variations in between. Hypnotic states or trance-like states occur naturally and spontaneously. Have you ever been daydreaming? Have you been so absorbed in a monotonous task that you lose track of time? Have you driven for a long period of time and got to a place and realised that you’ve driven on autopilot? Have you ever been lulled into a dreamlike state by a boring, boring speech? In those instances you are in a very relaxed state of awareness, you were in a trance. Why would we induce a trance? Once we know that brain is in this deeply relaxed but highly focused state, any of the therapeutic suggestions that we would like to impart are actually taken up in a much greater way. They have a much greater impact on attitudes, perceptions, sensations, or the behaviours we’re trying to change. Hypnosis in itself promotes a particular form of brainwave activity that allows the mind to take in and incorporate new ideas as if they’re your own ideas. It allows us to access what we refer to as the unconscious mind. The unconscious mind is so much more open to new ideas than the rational conscious mind that we are so much more aware of. Our conscious, rational mind is already pre-programmed to doubt, to question, to keep the status quo. It is the voice that will undermine changes and suggestions because we are programmed to repeat the script that we have already internalised from our very, very early experiences. Hypnosis can be undertaken by anyone. But there are a few things in common perhaps for those that are more hypnotisable. It’s important perhaps to have a reasonable imagination, to have the ability to get lost in a movie or a good book, the ability to concentrate and keep a mental focus. In these cases, hypnosis is going to be much easier for the person facilitating. Will I be in control when I am hypnotised? Many people worry that if they have hypnosis or if they agreed to have hypnosis that they will be in the position that somebody is entering their mind, perhaps, controlling their mind, perhaps, looking at things that they are not aware of and that ultimately, the person is not going to be in control. Many people are often a little bit perplexed shall we say about hypnosis or hypnotherapy after seeing hypnosis for instance on media. The idea that someone can tell you to become a chicken, to behave in a humiliating way is really not what hypnosis or hypnotherapy is about. One of the first things that I always say to anybody who’s considering hypnosis is, “you will always be in control. At no stage will you be doing something or be asked to do something that is against your will.” Those people for instance that behave like a chicken, are doing it because they want to please the therapist, the technician. They are not doing it because they have lost control and I think that is an extremely important statement. When we use hypnosis or hypnotherapy as a treatment tool, it is not about performance or making a stage show. Many people say, “I don’t know if I can be hypnotised,” and it’s a really, really interesting statement. We can all generally hypnotise ourselves. Many people find that they are often in a hypnotic state during their day to day lives. Have you ever looked out the window and become lost in your own thoughts and then startled when someone has brought your attention back? At that time, you are in a hypnotic state. At that time, you have become so focused on your inner thoughts that your connection with the reality and the outside world has actually lost its intensity. Have you ever driven from point A to point B and arrived at point B and thought, oh I don’t remember driving home. We call it driving on autopilot. In actual fact, one has become hypnotised by the monotony of that drive, one has become completely focused upon one’s inner thoughts to the expense of the reality of the drive home. Again, that is a hypnotic state. When we look at these examples, I hope that this enables you to actually recognise that most people have the capacity for hypnosis, have the capacity to focus upon their own inner world. Hypnosis in many ways is very much like meditation. Meditation asks you to become completely focused on your inner self. When we use hypnosis, as the therapist, we are facilitating that position, we are facilitating someone being in that state of relaxation, we are facilitating someone being that focused on their inner self. So, in many ways, the effects of meditation, for instance, that sense of calm, that sense of relaxation, that sense of literally being at peace with oneself is very similar to the feeling that one will have after hypnosis. Do I go to sleep when I am hypnotised? When someone is completely focused upon the inner world there is a loss of intensity of one’s awareness of the outside world. That is not the same as being asleep. You can be in a hypnotic trance or a hypnotic state with your eyes wide open. When one is in a hypnotic state you can still hear what’s going on in the outside world but you are not paying attention to it. As we go through stages of deeper trance the intensity of the outside world will diminish. At no stage are you completely unaware of your environment, there is always a level of awareness. However, at times the focus upon your inner self can be so intense that awareness is very, very vague. Is hypnotherapy always used as a treatment option? Certainly it would be one of the tools, it wouldn’t be something that I would use first off, however, people do come in and say, “I would like to have hypnotherapy,” and then that would be a case where we would work up to, why do you want the therapy, what are we dealing with and how can this be useful. How does suggestion in hypnosis work? What happens is that we will design a script that is read during the process of hypnosis. That script will contain many positive suggestions regarding change. Those suggestions are then heard in a very, very suggestible state. Over time, those suggestions become thoughts that you have regarding yourself. They start to become incorporated in your own self-talk. They start to feel like they belong to you. What is the difference between suggestion under hypnosis and suggestion in the interview state? The difference between suggestion under hypnosis and suggestion just in the interview state, is that when someone is very, very focused on their internal world, the change is faster, the change is more effective, the opportunity to integrate the suggestion occurs without the usual barriers. For instance, when we talk in therapy and as a suggestion is made, many times there will be cognitive barriers to adopting that suggestion. We already have a lot of negative self-talk or critical self-talk that will poo poo that statement, so, when somebody suggests something to us, our brain overrides those suggestions in many, many ways. “I can’t be that,” “No, they’re wrong,” “no, no, no, they don’t know what they’re talking to me about,” “Oh, yes that’s a very lovely thing to think but I know already that that’s not going to be helpful,” “I’ve already tried thinking that it doesn’t work.” These are the sorts of barriers that we come up against when you’re in a hypnotic state, these barriers don’t come up you are focused upon your inner world, you are not listening and responding to what’s being suggested you are accepting the suggestions without issue, that is why hypnosis is often more effective. What should I expect during a hypnotherapy consultation? So, basically what we start off doing is, I would invite you to take a seat upon my couch for instance. However, if that’s not what you like and you want to sit and be more actively involved, you can stay seated, however, we do suggest get yourself comfortable, feel relaxed, really get into a position that you know you’re not going to wriggle around or be annoyed by clothing. Okay, then I go through what’s called an induction during an induction what I am doing is literally talking you into thinking about yourself, I’m encouraging you to focus upon your internal thoughts. The more you focus upon your internal thoughts, the more and more you move into a trance state. We may, for instance, use a graded relaxation exercise and literally that is talking you through a relaxation from head to toe and as you move through that relaxation you are releasing energy and you are becoming more and more focused upon your inner world. At times we will use a script where we will encourage you to for instance walk down steps, or we may ask you to open up your mind’s eye and start looking very, very closely. Anything that literally gets you to listen and focus. By facilitating the focus you are literally becoming hypnotised. It takes a couple of minutes to induce a relaxed state. Once you have achieved a very relaxed state we can actually determine that by many of the physiological changes that we will see whilst you’re in that state. At that time we will then proceed to use the script and to read that script and to read those suggestions. If at any stage during that process we sense that there is distress and we can certainly see that in the change in your behaviour or physiological changes we will assist you coming back out of the trance once we’ve read the script and the suggestions have been made, we will then bring you slowly back to the room. After that, you’re wide awake feeling hopefully very relaxed and it’s an opportunity for you then to process the material that’s been placed. When we place suggestions, these will slowly be incorporated into your dialogue, into your internal dialogue. Changes may not happen overnight, we often will use a series of hypnotherapy sessions in order to achieve what we are we are hoping for. What is an example of the type of hypnotherapy you do? When does hypnotherapy not work or is less effective? I haven’t explained well enough the process of hypnotherapy and they are still incredibly anxious, the person is unable to relax, they are unable to sit still, they are unable to focus. In those instances, if you cannot focus on the instruction, you’re not able to focus on your inner thoughts. So, the instance is where hypnotherapy doesn’t work is if I cannot capture the attention of the person listening and there are always going to be times when that happens. If the person is fidgeting, if the person is irritated by something, if the person finds sitting there listening to someone irritating, it’s incredibly difficult for them to focus and let themselves relax. In these instances, I think there needs to be a lot more work around relaxation and around allowing oneself to relax. Many people struggle to relax in terms of actually allowing themselves to do that so when hypnotherapy fails it is because we have not captured the intention of the recipient and person in the room is distracted. It is very evident during the induction whether or not we’re able to capture somebody’s attention and in those instances, it’s better to stop to go back to the beginning and actually have a dialogue about hypnotherapy once again. It may not be ideal for everybody and there is always an alternative and in those instances, it’s about what else can we use, what else could we do, how about let’s talk about focusing our attention first. What is a person’s inner dialogue and how can it be used in hypnotherapy? When we look at talking to her inner self, what I’m referring to is the inner dialogue that is continuous within ourselves. Often we’re not aware of this dialogue on a day to day basis, however, once we start thinking, once we start focusing, that dialogue becomes more and more apparent. Hypnotherapy is a means of accessing this dialogue in a very non-intrusive way and helping somebody focus upon that dialogue. In terms of where the dialogue comes from, if we consider growing up, we receive messages from our environment, from our parents, from the people that we interact with, from our school friends and those messages we internalise into our own self-dialogue. Those messages aren’t always helpful. As parents, we don’t necessarily have a handbook on what not to say to our children growing up. These are the inadvertent messages that at times we’ve internalised in our self-dialogue that later down the track causes anxiety, cause us to feel inferior, cause us to feel unworthy, cause us to behave in a certain way. It is this dialogue that we access through hypnotherapy. It is this dialogue that we change subtly by adding in positive suggestions. One of the questions that I’m often asked is, “can I drive after hypnotherapy?” “After I’ve had hypnotherapy, am I okay?” I can assure you that after hypnotherapy you may feel tired but you are completely back in reality, you are back in the normal conscious state with your normal reflexes and normal level of alertness. There is no reason why you cannot drive after hypnotherapy. What are some common myths associated with hypnotherapy? Many common myths are that I will be made to do something I don’t want to do, that I will make, I will embarrass myself, I am also starting to hear that people fear that somebody could plant a suggestion and then use their mobile phone to activate that suggestion down the track. The conspiracy sort of theories. There’s also the concern that what if this change goes in and it’s not me, can you change me as a person. I don’t like somebody playing around in my mind, that’s dangerous. I also get people saying to me it’s not acceptable in the Bible. There are a lot of concerns that if somebody accepts hypnotherapy that biblically that this is considered wrong. It’s important to know that all of these are myths, that hypnotherapy does not change your mind Hypnotherapy doesn’t change who you are as a person. All we use hypnotherapy for is to help with suggestion and to help the suggestion get into your self-dialogue. You can always say no to that suggestion. You can always recognise that suggestion and say to yourself, “I don’t want to think that.” There is no means of making somebody change their behaviour, their thinking, their sense of self. Hypnotherapy is purely a tool to help with suggestion. Will I be able to recall the hypnotherapy? Many people may not recall the hypnotherapy clearly. It is not unusual to have a period of blank. Similarly when you’re staring out the window and you were lost in your thoughts and you are asked, “what were you doing then?” And you look at the person who asked you that question, “oh, I don’t know.” When you are completely focused upon your own thoughts you are not actively remembering, you are not actively laying down memory, you are focused on another activity, you are focused on thinking. Not everybody has a complete blank, there will be vague recollections and there will be a vague sense of the themes of what was discussed. Does my recollection of the hypnotherapy vary with the depth of my trance? Everybody is different in terms of their level of focus. A superficial trance will enable you to have a reasonable recollection of what was happening. For instance, if we were using hypnotherapy purely as a relaxation exercise there was no need to go to a deep trance. The use of a deeper trance would only be necessary in a more complex case when the suggestions, for instance, need to be repeatedly introduced. Therefore, if you were in a deeper trance the likelihood of laying down memory during that period is much lower than if you’re in a superficial trance. So, remembering the procedure perhaps is very much a reflection on the depth of the trance. What physiological changes do you look for that alert you that I am in a trance? So, the sorts of things that we look at is, we look for a change in the breathing, we look for a flutter of the eyelids, we look for a change in the relaxation demeanour of the body. We may ask you to do something and by doing that or following that suggestion physically suggests to us, the depth of the trance. At times we will bring you out of the trance to determine that you are in the trance so that you can return into the trance. That sounds rather unusual but that is a way for us to determine that the hypnotherapy is going to be effective. By bringing someone out of a trance and putting them back into a trance actually will increase the depth of the trance, therefore, it can be a really helpful tool to increase the depth, in the more complicated cases.